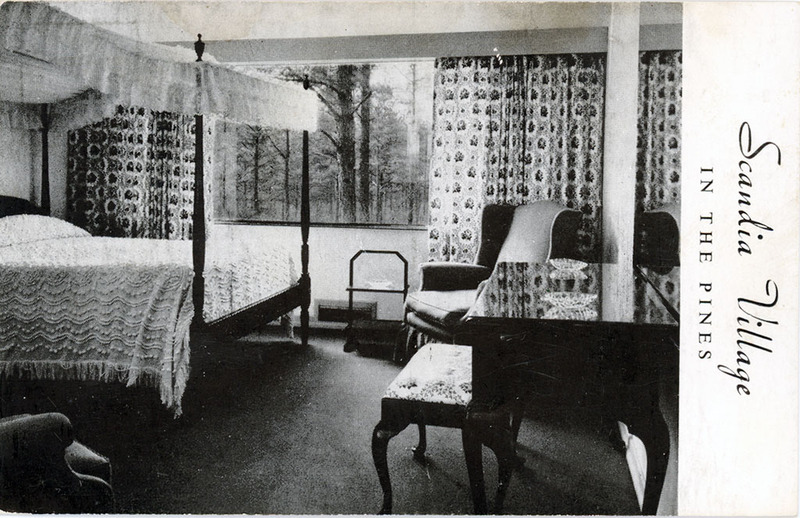 The Plantation Inn Motel and Restaurant, Raleigh, N.C.
“Gracious charm in pleasant surroundings” could only describe Raleigh’s now lost Plantation Inn. The classy motel offered road-weary travelers a hospitable and comfortable rest-over on the long journey along US 1 from the North to sunny Florida. The Plantation Inn Motel and Restaurant. One of the South’s finest, is located on US Rt #1, 5 miles north of the Raleigh City limits. 26 acres of hospitality and old south charm. For information and Reservations, Write P.O. Box 11333, Raleigh, N.C. 27604; or phone 919-876-1411. Our special thanks for a most enjoyable visit — Good food & good company! So far a good trip but the sun has been hiding until today — We tried steamed oysters at our favorite eating place last night. Many many thanks. We look forward to seeing you May 5th. Looks like Ginny and Bob were still basking in the hospitality of their friends back home in Connecticut. At this leg of their journey, I wonder where they were headed to? Florida, maybe? And ‘steamed oysters’ at their ‘favorite eating place’? Looks like the couple had traveled this route before. Despite its exterior appearance, the 106-room motel was never actually a plantation. It was built in 1956 of concrete block and masonry. Georgia native William Morse, bought the property in 1959, a few years after it was built. 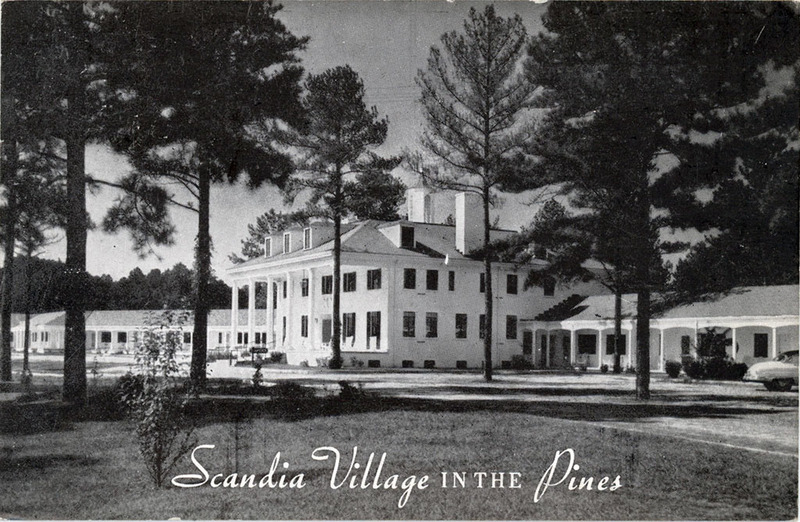 At the time its amenities included a small pond and walking trails through a stand of pine trees. He renamed motel The Plantation Inn. Meeting and banquet rooms, heated pools, children’s playground, room service, free coffee, private fishing lake, putting green. 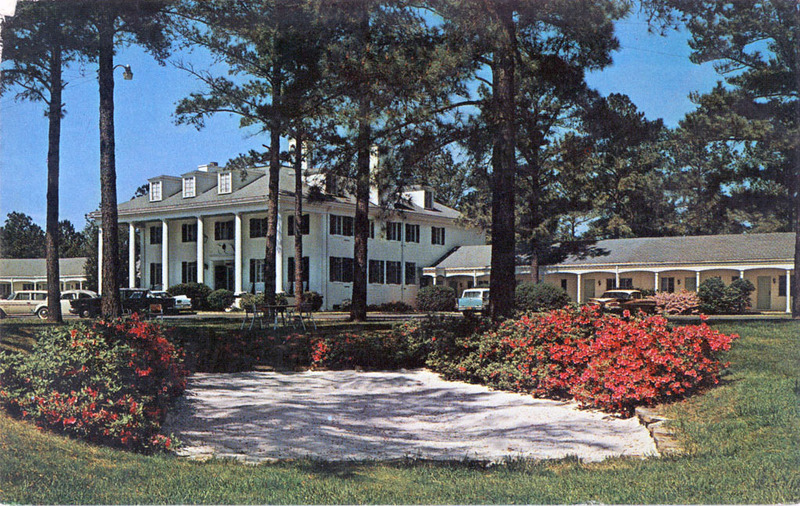 As its reputation as a haven of genteel ambience grew during the 1960s and ’70s, the Plantation Inn became a local mecca for native Raleighites, as well as for the traveling public. Countless weddings, family celebrations, business gatherings and special Sunday dinners-out took place at the now renowned hostelry. Under the management of Jim Hobbs in the mid-1970s, the Plantation Inn was rated among the best hotels in the country, along with The Velvet Cloak Inn in downtown Raleigh. At that time it must have seemed the heyday of the Plantation Inn would last for many decades to come. The property soon evolved into an upscale motor court where travelers from the Northeast could stop on their way to vacation in Florida. The motor court prospered, and by 1956 the proprietor was able to erect a commodious motel resort on the site of his humble cabins. 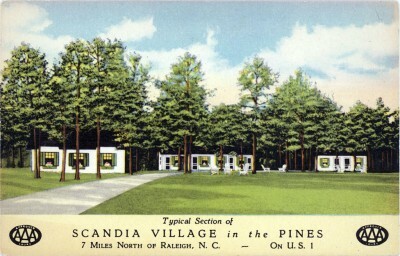 Scandia Village in the Pines, Raleigh, N.C.
6 mi. north of Raleigh on US 1 Raleigh phones 3-8842 and 3-6070. Room phones, air conditioned, 18 hole putting green, golf course near by. This elegantly furnished room in the ‘Old South’ style, characterized the accommodations at the new Scandia Village. The Plantation Inn continued to prosper through the 1970s and ’80s. Upon the death of Bill Morse in 1989, it was sold to local auto mogul Bobby Murray. He brought in new management and rebranded the motel ‘The Plantation Inn and Resort.’ By that time US 1, a two-lane blacktop in the 1950s, had become a multi-lane highway, and commercial development had begun to encroach on the bucolic oasis. Nonetheless, manager Jeff Blackstone continued the traditional graciousness of the Plantation Inn and brought its occupancy rate to 80%. However, two road projects spelled eventual doom for the Plantation Inn. Completed in the early 1990s, I-95, east of Raleigh, drew traffic away from the US 1 corridor, and later, the I-540 Outer Loop, built literally across the Inn’s side yard, further siphoned off potential clientele. Due to highway construction and increased commercial encroachment, by the late 1990s the occupancy rate had declined to barely 20%. Eventually the property was sold to developers, and on New Years Eve 2000 the Plantation Inn closed. In the spring of 2001 Raleigh’s Grande Dame of “Gracious charm in pleasant surroundings” was demolished. A non-descript, suburban big-box shopping center occupies the site today. It is called Plantation Point. 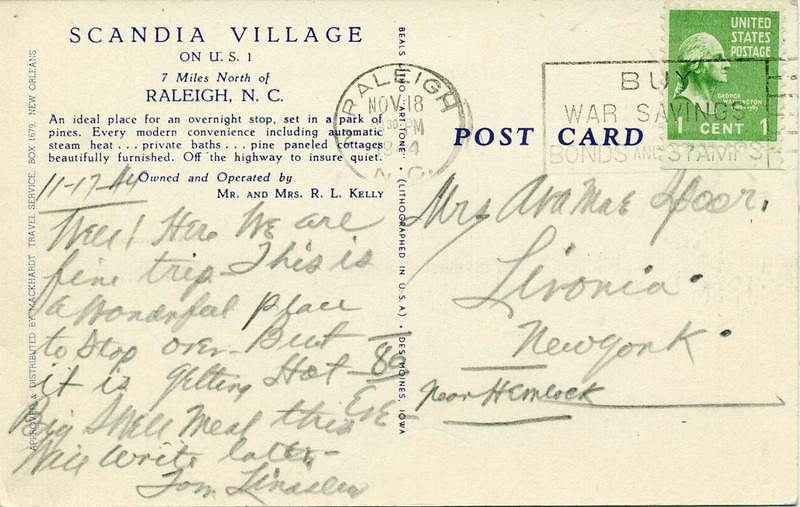 A publisher of comic, roadside, and national view-cards. 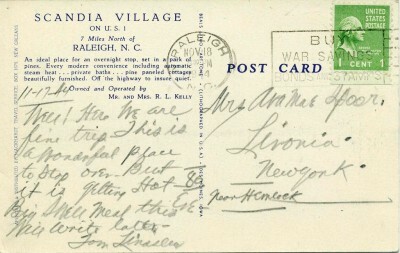 Produced military cards during World War One. Despite that these cards were issued under the trade name Art Tone Glo-Var Finished, they are indistinguishable from other linen postcards. The firm was sold to Associated Lithographers, Inc. in the early 1950’s. In the late 70’s or early 80’s I ate one of the best Thanksgiving dinners I ever tasted at the Plantation Inn. I remember how far it was out of town we had to drive to get to the place, in the middle of nowhere. It really was gracious and charming. Thanks for the memory! An overnight rest stop at the Plantation Inn was always a highlight for Snowbird relatives on their way to Florida in the ’60’s and ’70’s, and these were people not easy to please, they could have stayed anywhere. They loved the Southern Hospitality, and Southern Ambience. Had Raleigh had a beach, they would have made our little town their destination. But they had to go back up North with a glamorous tan, and the Plantation Inn poolside was a little too chilly in February. Florida couldn’t come close when compared to Plantation Inn hospitality service. This was and will always be a cherished symbol of Raleigh, and I think many people share that feeling. The nostalgia and historical Southern setting defined its beauty. It is a shame that Murray ran it into the ground, but to compare its elegance in the 70’s to the Velvet Cloak Inn as it stands now in ruin is an awful thing. The degenerative condition of the Velvet Cloak Inn, and both the ethical and building decay leaves the Plantation Inn with atleast some notion of pride and significance in comparison — and the cruel comparison up above should not be used. I have many wonderful memories of the old Plantation Inn. When my family relocated to Raleigh in the early 60’s, we stayed there for several weeks. It was late spring, early summer and we really enjoyed the pool. Later, my family would regularly partake of the wonderful Sunday buffets there. In high school, I took my prom date there for dinner before the dance. They had a organ player, Woody Hayes, I believe was his name, who would take requests. I asked him to play the theme from Gone with the Wind, “My Own True Love.” So very sad to see them tear it down. 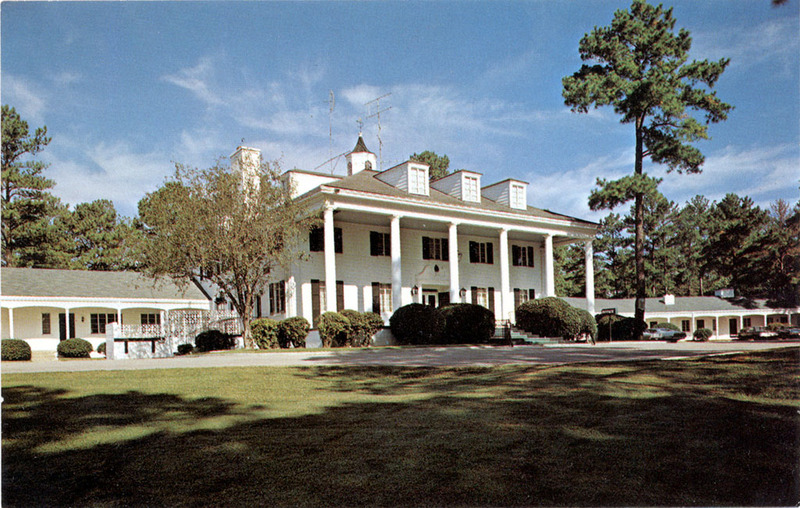 Tom Daniels: The reference to the Plantation Inn and the Velvet Cloak was made in the mid-1970s, and is not a comparison to the Velvet Cloak in 2013. You misread the sentence. Thanks for this story. They also had a putting green on the front lawn. “Sprawling” and “spacious” are appropriate adjectives. My family stayed there once when our furnace blew up and filled our house with smoke and soot. Wow, I was just telling someone about this place on sunday. I redesigned the grounds and a wedding garden out back around 1993, large french parterre in front. It was one of the first big landscape design-build projects of my career. Ironically, a client told me during a site visit about a shrub she salvaged from the old plantation inn when it was torn down. She had no idea that I personally planted that very shrub 20 years ago, so she gave it back to me – now it’s at my home. After service in the USMC and USN, I was sworn in to the NCARNG at the Plantation Inn in 1996. A small brush with it’s history, yes, but I always remember the place when I pass that way. It was a family tradition for us to eat Easter Brunch there for quite a few years, and then take Easter pictures out front (late 80s/early 90s I think…) I moved away for about a decade and when I returned 540 had been built and The Plantation Inn was gone. I never made the connection until now, that where the shopping center is now used to be The Plantation Inn! Ugghhhh what a shame. I remember eating a buffet Thanksgiving dinner at Plantation Inn (approx. 1985 or 1986) and having shrimp newberg ! I have a close connection to the P/I. My father worked there 30 years and retired with a banquet hosted by Mr. Blackstone. That was a fine organization dating back to Bill Morris. Nathan was there to refine every area of the “Plantation” to keep it graciously presented to its guests as per tradition. Excuse me, I wrote Bill Morris by mistake (been a long time) as I know so well it is Bill Morse. We had our wedding party at the Plantation Inn in 1986. So sad its gone. What a lovely place and how my mother enjoyed having our northern family down for a taste of southern charm. Just had a childhood flashback of this place. I loved it as a kid in the 90s. I had to call my mom and ask het what it was called. I wish it was still there! I was the night auditor at the Plantation Inn during the early 1960s and know some of the little hush-hush secrets of Bill Morse and his housekeeper/mistress, Ms. Trent. Ms. Trent and her daughter lived in the main house with Mr. Morse and it is alleged that child’s father was Morse. When Bill Morse’s wife and two children, would visit from Chicago, Ms. Trent and the child would get a room in the hotel and would not return to the main house until Mrs. Morse left. Bill Morse was the grandson of Charles Morse, a member of the very prominent Fairbanks-Morse family of Chicago. 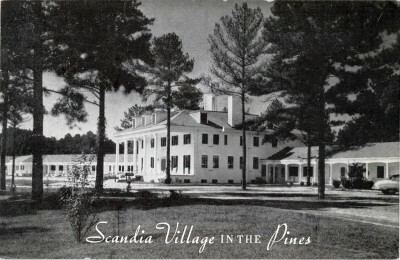 It is said that his grandfather bought the Plantation Inn and gave it to him on the condition that he and Ms Trent would move to North Carolina away from the family and prying eyes. For any of you who ever worked at the Plantation Inn, I’m sure you remember the two way speaker that sat on a table behind the front desk. It had been placed there by Mr. Morse so he could hear everything that was said by employees and customers. Sometimes he would leave it on and I could hear conversations between himself and Ms Trent. Being the nosy young man that I was, I found them to be very interesting at times and would indicate that they were more than business associates. I must say, as others have, it was a beautiful facility inside and out and it was very enjoyable to work there. The entire staff was pleasant to work with, including Ms Trent and Bill Morse. I have many fond memories of the Plantation Inn. When we moved here from Chattanooga, TN in early 1972 my parents stayed there until they found a place for us to live. Then many great memories of dinners there. What a wonderful restaurant and dining experience. The food was delicious and there was a piano player and you had white tablecloths and real silver on the table. It just gave you such an elegant feel. I was sorry to see it torn down. Great places like that are missed. My family used to stay at the Plantation Inn my dad would work in the Raleigh area. Fond memories are of playing putt-putt golf on the putting green in front of the hotel rooms, walking in the woods behind the hotel, and the Southern charm and friendliness of all the hotel staff. Later on his employer got a contract with Guest Quarters (now Doubletree) down the road. Needless to say, this place had nothing close to the charm the Plantation Inn had. I’m sorry to see that now it’s been replaced with a strip mall. With the modern success of boutique hotels and major chains trying to recreate the boutique experience, it’s obvious an opportunity here was missed. , loved walking the grounds and it sounds like it somehow maintained most of it’s charm throughout it’s existence. My second visit it was a very full moon – we sat outside for hours. I wish more of today’s properties remembered the charms of class, graciousness, and uniqueness. Today’s chain motels/hotels every hallway and room is exactly the same; instead of birds singing and the rustle of trees, you hear noisy HVAC systems, weedeaters, mowers, people fighting with each other, staff who can’t speak English to help you; management who acts like it is an inconvenience to provide assistance; along with a full “hot” breakfast which is rubbery egg discs from a plastic bag just thawed, and waffles/pancakes you have to make yourself with fake maple syrup. It is so sad that our world has become so plasticized – it’s the same from state to state – all the same shopping, the same hotels/motels, the same restaurants – just chain after chain. If you want something unique, you have to check into a resort paying at least $300/ night. Not many can afford that so we are stuck with same ole same ole. I just miss the class, charm, graciousness of the past. If a place is unique and still around, it gets bought out and revamped into the “SOP model”. I’m in my 60s – can’t imagine how those still around who were born in the 20s and 30s and see all the chains and violence and nasty of today. My Papa was born in 1905 and died in 1996 – so much has changed since he died – wonder what he would think of today’s world? I think the same for my great grandmother born in 1892, died in 1982 – what would she say! We have such an opportunity to have a wonderful world and yet greed and meaness cause us to throw it away. Many of the young of today don’t even know what it is they are missing and thinks us “old” folks are just nuts. Oh well, just feeling a little nostalgic. Sure wish the Plantation Inn was around for a sweet visit. 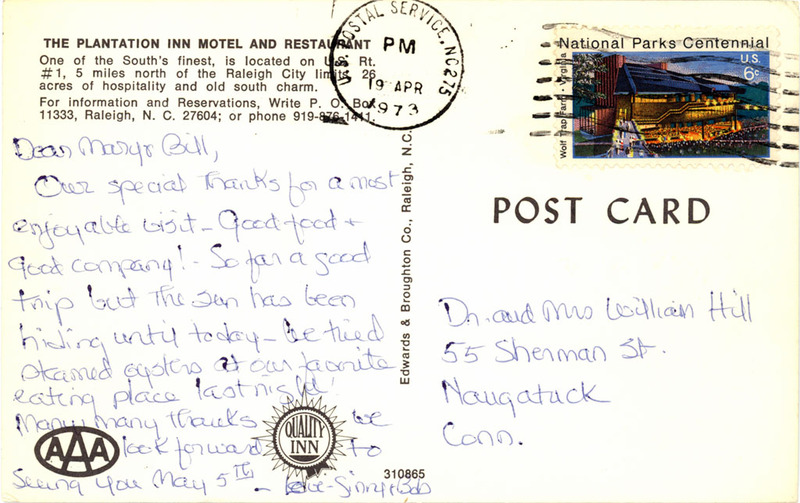 I liked the comment, if Raleigh had a beach, it would have been their destination – so true. from the past but so few take the time to do it. I have lived in Raleigh over 60 years. Swain’s was not on the same road. It was located on New Bern Ave (Hwy 64 East business) at the corner of Milburnie whereas the Plantation Inn was located on US Hwy 1 North. Thank you for holding up this piece of history. My grandfather was William Morse, and I spent much of my childhood running the motel grounds. This piece brings back fond memories.